provides a flexible solution for laboratory THz spectroscopy and imaging. It offers maximum flexibility with measurement capabilities in transmission and reflection without realignment of the optics. It is based on organic crystals, to allow access to terahertz frequencies not available with conventional antennas. The TeraSys- AiO includes all optical, mechanical and electronic components for the generation and detection of THz waves such as delay line, terahertz generator, terahertz detector, pump source optics, electronics, humidity sensor, purge chamber, dedicated software, and laptop. 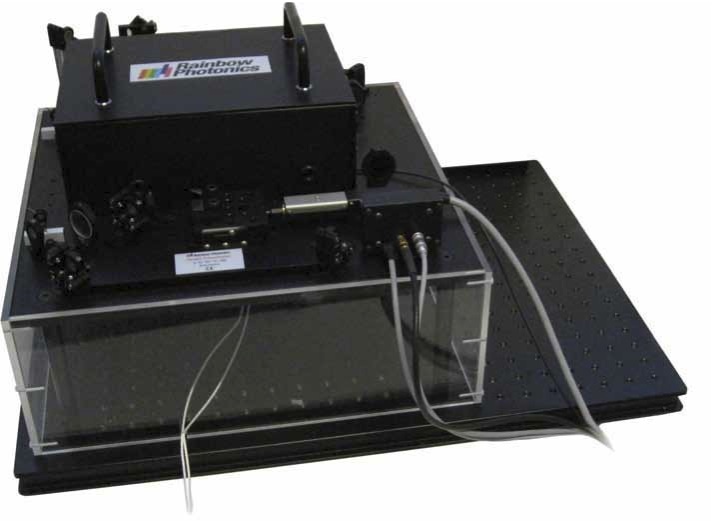 This terahertz system offers the most flexible solution for terahertz spectroscopy and terahertz imaging. 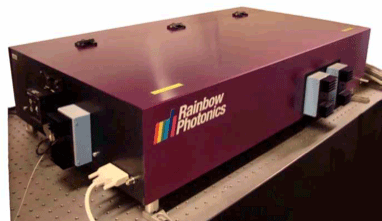 It can be used with any femtosecond laser at telecom wavelengths. It is based on organic crystals allowing a spectral range from 0.3 up to 20 THz. is a unique terahertz tunable narrowband source with a tuning range from 1.5 to 20 THz and a bandwidth of less than 100 GHz. The basic TeraTune is based on a flash lamp pumped laser (repetition rate 50 Hz to 200 Hz) with a special optical parametric oscillator (OPO) where one wavelength is tuned electronically with a special design to keep the bandwidth below 100 GHz. Terahertz radiation is generated via frequency mixing in the novel organic nonlinear optical crystal DSTMS ideally suited to achieve highest terahertz conversion efficiency. This is a flexible solution for laboratory terahertz spectroscopy and is available in two options: Transmission and Reflection. It is based on organic crystals, to allow access to different terahertz frequencies not yet available with conventional antennas. The TeraKit includes an optical path with a delay line, terahertz generator, terahertz detector, optics and electronics. It can be used with femtosecond pulsed laser sources operating at 1.5 µm. 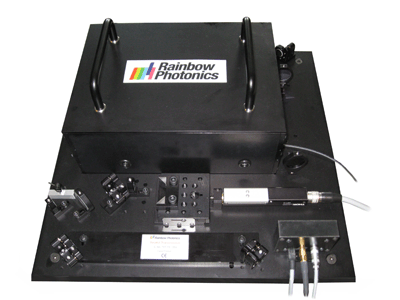 Rainbow Photonics AG offers THz generators/detectors based on various organic crystals: DAST, DSTMS and OH1. They are optimized for operation at Terahertz frequencies from 0.3 - 20 THz. 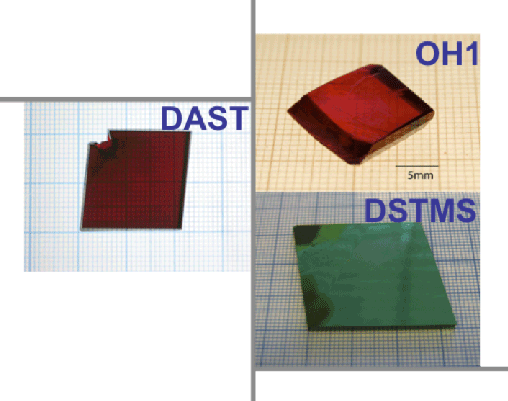 The organic electro-optical crystals (DAST, DSTMS, OH1) have high electro-optic coefficients and show ultra-fast electro-optical response for modulation frequencies up to 200 GHz. These crystals can also be used for electro-optic detection. 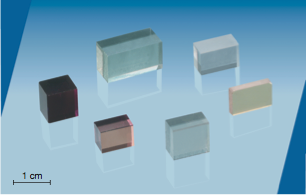 Rainbow Photonics AG offers KNbO3 crystals for electro-optics and nonlinear optics. They can be used in applications such as such as optical second-harmonic and sum-frequency generation, electro-optic switching and modulation. Metal-ion doped crystals offer fast photorefractive response for real-time holography, two-wave mixing and four-wave mixing. Please contact us if you need help in your critical OEM or laboratory application.